 An accessible and revealing, against-the-grain look at the twists and turns both of owning and being a slave in the 19th- century and of the business of researching, revising, and writing history. Using the most traditional and time-honored tools of historical investigation, Freehling (History/SUNY Buffalo) tells compelling stories of how and why the Civil War happened. Without sentimentality for Dixieland plantations or an ideologically driven discussion of the evils of slavery and other oppressions, the author demonstrates the need for historical research and writing that takes into account the points of view of all historical agents, including white women; poor, white ethnics; Native Americans, and African-Americans, male and female, slave and free. 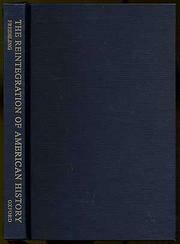 Rather than dramatic military battles and presidential proclamations, Freehling highlights what was happening in local communities and in state legislatures, demonstrating throughout how Northern desire for white-only republics, as much as Southern desire for continued slave-owning, fueled the continuation of slavery in spite of America's rhetoric of freedom and equality. By not letting anyone off the hook of historical responsibility (including Lincoln and Jefferson, who both thought of African-Americans as racially inferior and incapable of living freely among whites), the author dramatically complicates and enriches the texture of 19th-century American history. Perhaps best of all, he gives an insider's account of historical research, showing the hard work or sifting through mountains of material to find the few gems that alter our understanding of the past. Freehling casts light on the murkiness of the antebellum American past and shows how close we are to, and how far we are from, understanding something of the fullness of American history. This is a well-written, mature collection of essays that deserves a wide readership.